HOUSE RULE. : A RULE (AS IN A GAME) THAT APPLIES ONLY AMONG A CERTAIN GROUP OR IN A CERTAIN PLACE. 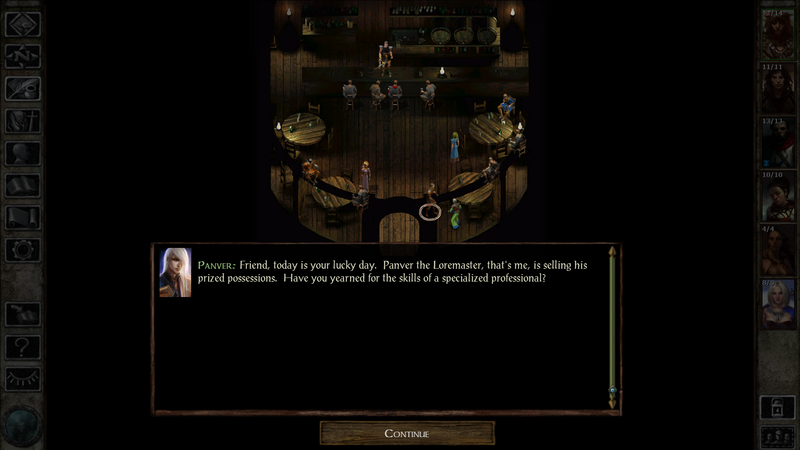 This tweak mod represents a compilation of various house rules and tweaks which are designed to change certain aspects of Icewind Dale Enhanced Edition. Characters gain set HLAs every 5 levels starting at Level 15 based on their class. Purchase Magic Tomes to add or change kits of your characters in game. See mod's readme for more details. the way it is in BG2 isn't going in a tweaks mod because the screen is hard coded. So this way would work. How are you going to tie it to x number of levels? I really don't want to add a script to every area or something. I'm familiar with the invisible creature trick I used it in my Kit Tomes Mod. 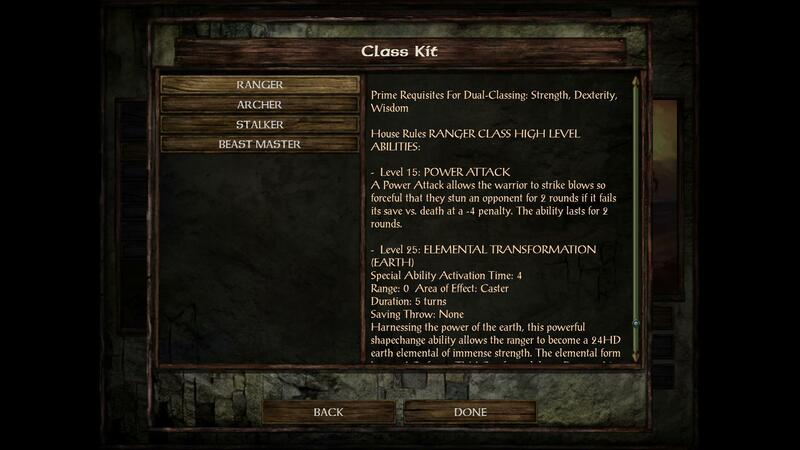 You give the summon ability in the clab as a one time thing for each level that it is acquired. (Ie make it remove itself permanently as the last command in the spl, or, perhaps better, make the creature remove it before destroying itself). AFAIK, there is no HLA screen hardcoded to IWDEE but the abilities themselves are there already in the game files. there's no way to patch the base class directly? Are there other examples of what you are saying? I'm not seeing it, I get the do something and destroy itself bit but it would have to check every level or something? ATweaks has something to replace the bhaalspawn powers, I guess that would be tied to chapters not levels and things like Refinements totally revise HLAs I'm just looking to give X power on level 15 and 25. Maybe there's a kitmod out there that gives a special ability on every X level or on level X or something? That would be super easy, just appending a line to CLAB files. Add abilities at whatever levels you want. You could combine it with the invisible monster summon to give the player a *choice* of powers. In fact it doesn't need to be invisible, you could just make specialized, single-use variants of Wish. Have a genie appear, tell you the fates have taken notice of your deeds and you are to be rewarded with a new skill, etc. Downside is, no descriptions of the HLAs. Of course you don't need an invisible creature or a script at all; you could set it up like Enchanted Weapon, where using the ability presents a list of HLAs in the bottom row that you could right-click on to read about them. Clicking one would grant you the spell, no script needed. Controlling how many times you could take each ability would be tricky, but not insurmountable. Atweaks scribe scroll is the model that I am thinking of. You summon an invisible creature. That creature talks to you. It checks to see how much gold you have and what spells you have memorized (and possibly if you are indoors). If you don't have enough gold to scribe even a 1st level spell, you don't have any relevant spells memorized, (or possibly if you are not indoors), then it will give you a 'sorry' message and destroy itself. (note the spell itself has eff's that remove and reapply the spl--this is not done via script). It gives you options based on this information. For example, if you have enough gold for 1st level spells, it checks to see what (if any) first level spells you have memorized, then it gives you an option to scribe those spells. When you scribe a scroll, it removes the relevant spell from memory, gives you the scroll, takes the gold, and destroys itself. In the clab at the relevant levels, you have a summon spell. This is a 1 time spell that will remove itself via eff. The creature talks to you. It checks whatever prerequisites you want to make it check for that are detectable by script for any given ability. Some abilities wouldn't need to do this if they have no prerequisites and you can select them an unlimited number of times. The comment about ADD_SPELL is there so the creature can detect custom spells. 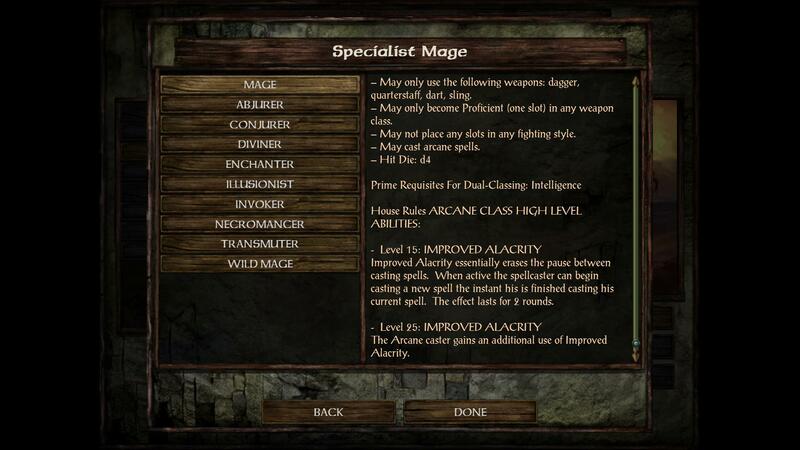 It would only be able to detect spells that are located in spell.ids. ADD_SPELL will add a spell to spell.ids. ADD_SPELL would be necessary also (one way or another) for the creature to give you the spell. The easiest way to do this would be through custom spl's that give the relevant ability. Maybe there is a script action that would allow you to give an ability directly, however. Not sure. Once all of the checks are made, the creature gives you your choice of ability. Once the choice is made, the creature gives you the ability and then destroys itself. You no longer have the ability that summons the creature that gives you the ability as the spell removes itself once cast. The Enchanted weapon trick does not seem feasible. How does your (eg) 20th level selection 'know' that you have selected (I don't know) Death Blow so it can give you Super Death Blow as a selection? @Grammarsalad Thank you for the reply. I see what you are talking about, I'm not sure that is the right way either, the right way is for the screen to show up and you pick your HLAs right? That may be the best way we could work around that. That being said, I'm not trying to implement directly the HLAs, although I could easily see (well not so easily as it would take some additional coding) adding that method as an option to my mod. I've asked @subtledoctor for assistance with what I had in mind and he said he could easily whip up the TP2 code, I will take it from there and add my little vision. If you'd like to further extend as an option the whole HLA thing that could be possible. To me, IWD is more low magic and HLAs would unbalance a bit too much. What I had in mind is spelled out in OP.. I was thinking at Thief Level 15 you could get say "Set Exploding Trap" as a free special ability at Level 15 of your class. It could be another use at 25 or a different ability. Maybe Use Any Item but it seems not as useful in IWD than in BG2... I feel it's probably better to just give another of the same in this. Warrior (Paladin, Fighter etc) maybe get Hardiness or Power Attack or something. I missed it earlier, but I think @kensai‌ is disagreeing about the hard code comment..
that's not the HLA screen that's the spell screen, isn't it? Like maybe he's running a sorceror and leveled him up and added the quest spells into regular spells in the game? No, apparently some people actually have the HLAs working in IWDEE. I'm not sure how, and it doesn't really interest me. BUT, because @smeagolheart‌ asked for it, here is a proof-of-concept mod for arbitrarily adding abilities to classes/kits. As-is, this gives fighters Whirlwind at 15th level and Greater Whirlwind at 25th level. It has instructions for changing them to different HLAs and/or different levels, and for adding abilities to other classes as well. This can also be used for abilities other than HLAs - give Tracking to barbarians, give Lathander's Boon to paladins, whatever you want. It can also be used to give wizard spells to wizards (say, if you want some spells to be auto-learned at certain levels instead of hunting for scrolls) or to give priest spells to priests (you could give druid spells to clerics and vice-versa). This can also be adapted for use within other mods if you like. Go crazy. I've released V.1.0 of the mod, the OP of this thread has been updated with the relevants. Give this guy a like:) for getting this cool stuff together! @smeagolheart‌ and I are looking to enhanche some used bams. But you can all enjoy the mod right now. You say that it is recommended to start a new game to experience everything, will I still have to start a new game if I only want the HLA? @skatefezz you don't have to start a new game for that unless you've already passed the relevant levels in your game. For example, if you are level 30 then it won't retroactively set HLAs for you. Cool. In case anyone's wondering about load order, most components here should be installed in the early-to-middle of thd load order. Definitely before Scales of Balance. But the 'class HLAs' component should be installed *after* any kit mods, including SoB. I'm pretty happy with how it turned out. subtledoctor, thank you for getting me started with the HLA portion. I used your adaptive part as the main part but well I'm sure you can probably just look and see how I used it. It tried some of the HLAs like Dragon's Breath, Storm of Vengeance and Use any Item and they didn't seem to work as they do in TOB like they are not fully integrated which shouldn't be too surprising since they aren't advertised as a feature of IWDEE. I'm pretty happy how it turned out, still keeps them with a low footprint in the game but they are there if you need them.. I'm looking for making my Wizard Slayer/Thief viable again (via the Use any item HLA). Does this mod help with that? no Use Any Item is not in the mod. I was thinking of using the use any item skill for bards since it seems to fit them more than thieves as jack of all trade types. But when I tested it, it didn't unlock things like you'd expect. You can add it and but the items don't seem to be coded to work with it, they still remained locked. I suspect there is a flag on each and every item that lets it be unlocked with UAI rather than the easier way of just flagging items that you DON'T want unlocked with UAI. 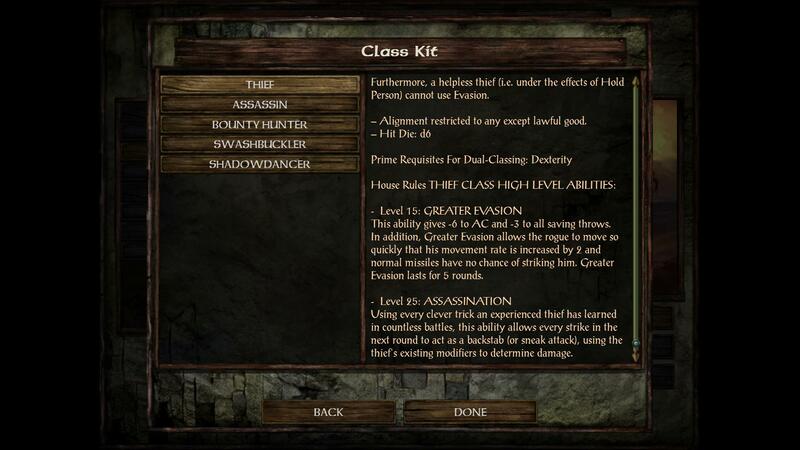 There is a PDF in the initial post that lists all the HLAs that each class gets. I would have liked to add summon deva as well but this mod adds a power via a table, there is no way to check for alignment dynamically that I know of. I also tryed Dragon's Breath and Storm of Vengeance and they didn't seem fully implemented so they are not in the mod either. Use any item: if it doesn't work, I suspect that it just doesn't work. But if you're right, then could be used to give eg thieves, read scroll and/or a more limited use magic item at some suitable level. That would be very cool. Edit: I want to give you an example that I know works because I've done it. after you identify it, (can createitem misc3p for glasses of identification), it will show as cannot use item. So UAI isn't working, as I say either it's an engine thing or there's some flag missing from every item. So I messed around and got use any item to work.. Then I decided I'd like to try adding HLAs every 5 levels instead of every 10. So you'd get HLAs at 15, 20, 25 and 30. 30 being the level cap so that might not be all that useful, so really it's mostly 3 instead of 2. Here's what I have. Again, Summon Palentar / Deva not really feasible without some extra coding. ... Again, Summon Palentar / Deva not really feasible without some extra coding. "I would have liked to add summon deva as well but this mod adds a power via a table, there is no way to check for alignment dynamically that I know of"
that you want to give summon Palentar to specific alignments and diva to others? Is this true? If so, then it is quite easy to do this. It just requires that you create a new ability and assign that ability via clab. That ability will have exactly nine effects: nine 177s, each that applies to a separate alignment. Then you have nine eff files, all #171, each referred to (in the resource key) by one of the 177's above. So, lets say that you want only LG priests to get Summon Deva (I forget the details--lets just say). Param 1 is 8, (to reference align.ids) Param 2 is 11 (to reference LG alignment). In the resource key, you reference your 171 eff file. Your 171 eff file will have in its resource key the summon deva spl file. I think it's fine without them but maybe worth looking into I guess. I've updated the mod to version 1.1. You should completely uninstall the old version before installing this version. - Added Bonus Merchants for IWD:EE very similarly to the BG2 collectors edition bonus merchants they have items from Planescape Torment and Baldur's Gate 1 and 2 in their inventory. They are cleverly named Doluv and Jiedra and are probably grandparents / related in some way to Joluv and Diedre. - Added an option to load up Orrick's shop with all his items at the start of the game without having to wait for specific conditions that aren't working for some people. - Added an option to remove the save from fire arrows since it doesn't make sense to me conceptually that acid arrows and ice arrows allow no save but fire arrows do. The original post also has a readme PDF with complete information on the mod.